October 10, 2006: UH Students Against Sweatshops (“SAS”) founder Tim O’Brien poses a question about the non-sweat free UH logo clothes being sold in the bookstore at the fall staff forum. The staff forum allows UH staff to pre-submit questions that are then answered by the university president and his executives. President Jay Gogue and Vice President of Finance and Administration respond by lying and saying that they’ve addressed the issue the best they can. They’ve actually haven’t done anything because the sweatshop issue has not been raised. Check out the lies here. November 13, 2006: Tim O’Brien and UH SAS advisor Lenwood Johnson hold a press conference that gets broadcast on Channel 13 news. Read the story on their website. Or view the clip here. December 19, 2006. O’Brien, Johnson, Students for Fair Trade (“SFT”) members Ross Barnard and Manisha Bhalesha and others meet with University president Gogue to discuss fair trade and sweatshop issues. Gogue makes some promises on fair trade concerns but ducks the sweatshop issue. May 18, 2007. O’Brien and Taylor Gibson attend the Staff Council spring forum and ask what the administration has done on sweatshops since the question was posed seven months ago in the fall staff forum. John Rudley, just named interim president and chancellor answers by introducing O’Brien and asking the name of his student groups. Rudley totally avoids the question instead mumbling about a “global economy.” O’Brien buttonholes him after the forum requesting a meeting. May 29, 2007. O’Brien, advisor Johnson, SFT members Diane Aguirre, Martha Dew, Amnesty UH chapter officer Alex de La Rocha, exiled Allen Parkway Village resident Njera Shakur and Black Panther Party member Kenya Shabazz meet with interim president John Rudley. O’Brien sent information on the Worker’s Rights Consortium and the Designated Suppliers Program in advance of the meeting as requested. O’Brien explains how the University is licensing their logo to companies that that use sweatshops in their supply chains. Rudley does his usual duck and dodge of the issue. June 4, 2007. Rudley sends letter to UH SAS saying that the next meeting will not include any community members. It’s obvious that Rudley an African American is embarrassed, ashamed and humiliated that the three African American community members, Johnson, Shakur and Shabazz saw his support of slave labor. Rudley cannot bear to have members of his own race witness his bowing and scraping to his corporate master. Week of June 4, 2007. SAS hand delivers a card and gift to John Rudley’s office. The gift is a stick of underarm deodorant. August 9-12. SAS members attend the United Students Against Sweatshops conference in Detroit, Michigan. Week of August 13, 2007. Fact sheets get distributed to most faculty mail boxes. The flip side of the fact sheet is an advertisement for the SAS sponsored September 5th Stolen Hours movie showing. August 23, 2007. Flyers with a picture of President Rudley and a dialog balloon coming out of his mouth with the saying “I laugh at the exploitation of UH apparel workers” are delivered to top administrators mailboxes. The flyers also carry six documented facts concerning the administration’s involvement in sweatshops. On or about August 24, 2007. John Rudley and provost Donald Foss cancel their appearance at the Faculty Senate meeting. They had been scheduled to appear for at least three months. It is unknown if they feared a direct action by the UH SAS or not. The search for a new chancellor and president has been ongoing all summer and Rudley would have addressed that topic if he didn’t cancel. His office confirmed he went on vacation. Foss, a Caucasian, has a history of anti-people of color behavior. September 5, 2007. SAS screened “Stolen Childhoods” a documentary about child labor all over the world. September 5, 2007. SAS hosted the Open Journal show on KPFT. The guests were Zack Knorr, international campaign coordinator for United Students Against Sweatshops and Lenwood Johnson, the advisor to SAS. September 7. Rudley sends a letter to UH USAS claiming that we were requesting a meeting. In fact, Rudley had requested in our May 29, 2007 meeting that we contact his office for a follow up meeting. SAS requests that Rudley report on his contacts with other University presidents concerning their handling of the sweatshop issue. SAS also requests that Rudley meet with the African American community and explain why he barred African Americans from meeting with University officials and SAS. Rudley did not keep his word from the May meeting where he claimed he would speak with other University administrators about how they have addressed the sweatshop issue. It’s clear the Rudley’s style of management is to lie to students and disrespect community members. September 19, 2007 SAS screened “Rising Sun,” a movie about a sweatshop in Kenya that was produced by an intern for the United Students Against Sweatshops. October 1, 2007 The Student Labor Action Project (SLAP) did a banner drop in front of the M.D. Anderson library. The story in the Daily Cougar included a large color picture and took up almost a half a page. Check it out here. October 1, 2007 SAS founding member Brittany Keele had an editorial published in the Daily Cougar. Check it out here. November 7, 2007 The UH Student Labor Action Project did a banner drop from the awning of the Welcome Center. See the Daily Cougar article here. November 8, 2007 SAS members participate in a national day of action sponsored by United Students Against Sweatshops. SAS members hold a “Sweat Free Awareness Day.” Right wing talk radio station KTRH interviews SAS member Tim O’Brien. The event is held in the University Center Arbor where lots of students, faculty and staff learn about SAS’s sweat free campaign, make donations and show their support. December 6, 2007 SAS members participate in a study in at the president’s office. Daily Cougar reporter Zinetta interviews SAS member O’Brien and publishes a story in their January 3 in between semester online edition. Check it out here. December 15, 2007 SAS members leaflet at the Galleria Footlocker store in support of the Teamsters and to call attention to Footlockers discriminatory practices. New Era, a supplier to Footlocker is also a target of the informational leafleting. December 18, 2007 The first off campus SAS meeting is held. SAS members map out their entire spring semester action plan. January 16, 2008. We went to the Student Government Association with a bill that called for affiliating with the Worker’s Rights Consortium and signing on to the Designated Supplier’s Program. Our member Tim O’Brien is on the SGA and filed the bill. The SGA voted unanimously to pass it. See the story in the Daily Cougar here. January 23, 2008. For the national day of action we invited the UH president Renu Khator to come to the Chie Abad speech in February. See the video link here. February 6, 2008. We hosted a campus screening of the documentary “Made in L.A.” Learn about the move here. February 7-10, 2008. SAS members attend the United Students Against Sweatshops winter conference in Miami, Florida. February 11, 2008. Our member Brendan went to the President’s office to follow up on our meeting request. Khator’s staff called the police on him when he wanted to wait in the lobby. See the letter he wrote to the editor about it here. February 12, 2008. Member Trey Pharis had an editorial about sweatshops printed in the Daily Cougar read it here. On February 25 We launched a phone ‘bomb’ on President Khator. Allies from all over the country called in asking her to sign the DSP. According to our USAS organizer Zack Knorr their office sent over 1,000 faxes. Later in the afternoon we marched to Dr. Khator’s office and presented her with a huge phone asking her not to hang up on the workers and sign the DSP. The Daily Cougar published an article about it check it out here. February 27, 2008 Former sweatshop worker Chie Abad spoke to an overflow crowd in the Pacific room. We also heard from Herbert Gonzales an organizer from Unite HERE and some former Aramark workers who are working with the SEIU on their current campaign. After the talks about 20-25 folks walked over to the administration building and posted letters on the door to sign the DSP. and the last part here. February 27, 2008. Harris County AFL-CIO labor council secretary Richard Shaw had an editorial about sweatshops published in the Daily Cougar. Check it out here. March 3, 2008. We received a threatening letter from Chancellor / President Khator. Read it – Khator letter. 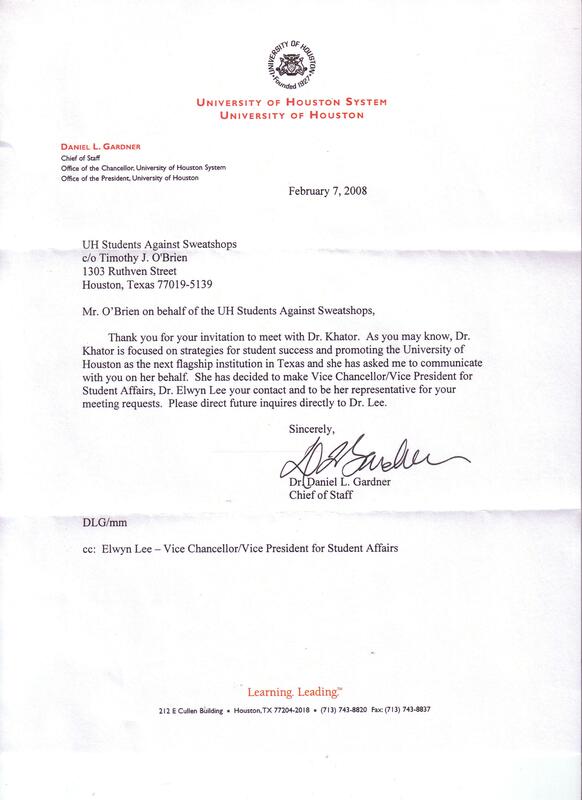 March 6, 2008 We had a nice banner that said “Students have no voice,” to greet Dr. Khator when she attended the staff council. Check out the video here. March 11, 2008 Dr. Khator appoints an “apparel task force” with 5 faculty, 1 staffer and one student. March 26, 2008. We hosted a screening of China Blue, a documentary about a Chinese sweatshop that manufactures blue jeans. Movie info here. March 31, 2008 We held a mock funeral and paraded around the campus with a coffin and tombstone. Then member Markos Mendoza read a eulogy in front of Khator’s office where we presented Provost Don Foss with the coffin and tombstone. Check our facebook site for photos. Read the Houston Chronicle story here. April 17, 2008 We hosted Carmen Duran from Tijuana, Mexico. She was the principal cast member in the documentary Maquilapolis. See www.maquilapolis.com for more info. We screened the film in Cullen Auditorium in front of almost 500 students. June 5, 2008 We delivered a list of the top ten reasons why UH is a fourth tier school Dr. Khator’s office. One of Khator’s aides took the list from us and went kind of ballistic about not wanting her picture on youtube. It appears that their nerves are getting frayed. It’s too bad that Khator’s inaction makes her own staffers mad at the wrong party. Read about the rest of our activities after June 2008 on the media page.